Manilakbayan ng Mindanao 2015 was a protest caravan from Mindanao to Manila that brought the voices of the Lumad and other sectors to the national capital. The 700-strong contingent represented different sectors from Mindanao, majority of whom are Lumad. One the key issues raised is the attack on Lumad schools by state and paramilitary forces. These schools were initiated by the indigenous peoples’ organizations with the support of NGOs and church groups to address illiteracy and the lack of schools in the hinterlands. The 67 indigenous Lumad schools have been subjected to various forms of attack from the military and paramilitary groups, such as encampment, burning of school, threats and harassments to teachers and students and killings of school personnel. The recent killings of ALCADEV school head Emerito Samarca along with Lumad leaders Dionel Campos and Datu Bello Sinzo triggered the evacuation of Lumads from their ancestral lands, seeking sanctuary at Tandag City Sports Complex in the province of Surigao del Sur. An estimated 40,000 Lumads were displaced from their communities due to heavy military operations this year. Manila Today presents an interactive timeline of the Manilakbayan ng Mindanao highlighting the major events in their journey. Delegates from the regions of Caraga, Socksargends, southern, and northern Mindanao converged at the Lipata ferry port in Surigao City, Surigao del Norte. From Surigao City, delegates of Manilakbayan reached Tacloban City. They were warmly welcomed by organizations BAYAN Eastern Visayas, KARAPATAN EASTERN Visayas and People Surge. At around 11am, supporters awaited the arrival of the Mindanao contingent at Robinsons Marasbaras, Tacloban. Marissa Cabaljao, Spokesperson of People Surge said that the Lumad and peasants’ experience in Mindanao was no different from rural poor communities in Eastern Visayasa, accusing the state, US and foreign interest of disaster militarism and capitalism. Cases of extrajudicial killings increased especially in the areas gravely affected by Yolanda, while private corporations entered various arenas of public service for business and widen the scale of plunder of natural resources. The Manilakbayan contingent marched with People Surge across San Juanico Bridge. Manilakbayanis, as the participants of Manilakbayan called themselves (and a portmanteau of words “Manila,” “journey” and “heroes” in English), were welcomed by different progressive groups led by Bagong Alyansang Makabayan and Karapatan in Matnog port in Sorsogon. The caravan was also welcomed by locals along major roads in Bicol region where locals waved red flaglets bearing the call “Resist Oplan Bayanihan!” and “Stop Lumad Killlings!” to show their solidarity with the people of Mindanao. The caravan then proceeded to Legazpi City for a solidarity program fronting the capitol. A “Kainan ng Bayan” or boodle fight was feasted by both Manilakbayanis and the locals showcasing Bicol’s best delicacies, as a symbol of the region’s commitment to support the Mindanao people. A grand “salubungan” through an exchange of cultural presentations was also held in Naga city. At Tabugon, Quezon, a flag dance performed by the Southern Tagalog Cultural Network welcomed the Lakbayanis from Mindanao. Together with Gabriela-Quezon and its local chapters, they held a caravan to the Southern Luzon Command (SOLCOM) of the Armed Forces of the Philippines (AFP) in Lucena, Quezon, where hundreds of Southern Tagalog farmers and residents hit continuing militarization and human rights violations in the region. Church workers, teachers, and students also hosted a welcome program in University of the Philippines Los Banos where the delegates of Manilakbayan 2015 spent the night. Together with the Southern Tagalog delegates of Manilakbayan 2015, Manilakbayanis held a march-caravan to Alabang, Muntinlupa City. Around 200 members of progressive organizations in Metro Manila joined the march from Alabang to Sucat People’s Park where local barangay officials welcomed the delegates and hosted the solidarity lunch. The groups then led the caravan to Roxas Boulevard where they held a torch parade to the Redemptorist Church in Baclaran. Church workers and supporters welcomed the delegates. Church volunteers also served warm soup while Manilakbayanis set up camp. Manilakbayan delegates marched from Baclaran to Bonifacio Shrine in Manila, where students from different universities in Taft-University Belt expressed solidarity to the Lumad’s struggle. Passing Taft Avenue, students and administrators of Taft-based universities held banners and ribbons to welcome the marchers from Mindanao, Southern Tagalog and Metro Manila. Students from De La Salle University, College of St. Benilde and St. Scholastica’s College distributed water and food for the Manilakbayanis. As they reached the Bonifacio shrine, hundreds from different organizations under Bagong Alyansang Makabayan greeted the Lumad people and Manilakbayan delegates. A program was held to mark the beginning of their month long campout in Manila. They later trooped to Mendiola to vent their grievances at the foot of Malacanang Palace, the residence of the President of the Philippines. “Kalampagin natin ang gobyernong ito. Papanagutin natin ang gobyernong ito (We should rattle this government. We should hold this government accountable),” said KASALO CARAGA spokesperson Josephine Pagalan. 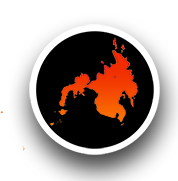 KASALO stood for Kahugpungan sa mga Lumadnong Organisasyon sa Caraga (Organization of Indigenous Peoples Organizations in Caraga). “Ilang beses niyo man kaming pataying mga Lumad, lalaban at lalaban pa rin kami. Dahil karapatan naming ipaglaban ang aming lupa, karapatan naming ipagtayo ang aming edukasyon (No matter how many times you kill us Lumad, we will continue to fight. Because it is our right to defend our lands, it is our right to build our education), ” concluded Pagalan. “This is your university,” declared UP Diliman Chancellor Michael Tan the night the Manilakbayanis arrived in the flagship campus of the premier state university, University of the Philippines (UP) Diliman. The UP Diliman community housed the Lumad on campus for one whole week, devoting various facilities for the use of the Manilakbayan and the propagation of the Lumad issues inside the university. “What’s at stake here is the Lumad schools, the heritage, the yutang kabilin (ancestral land). The Lumad must survive,” said Chancellor Tan. The campsite turned into an alternative learning venue as UP students flocked to the Kampuhan daily to learn more about the plight of the Lumad. The kampuhan in UP Diliman bared the support of individuals and groups from outside UP as well as entertainment industry personalities to the plight and call of the Lumad. At night, the UP Fighting Maroons men’s basketball team held a basketball clinic for the Lumad children. 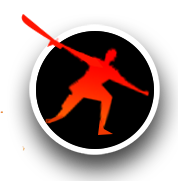 The University Athletics Association of the Philippines basketball season was ongoing yet the team gave time to meet and play with the Lumad children, who were also said to be enthusiasts of the sport. The Lumad children have previously only been able to play the game with makeshift baskets in their communities. Hundreds of Manilakbayanis protested at the Commission on Human Rights (CHR) for the agency’s ‘culpability on attacks against schools, communities and people in Mindanao’. Since President Benigno Aquino III assumed presidency in June 2010, indigenous peoples (IP) group KATRIBU has recorded 68 IP victims of extra-judicial killings, 1 enforced disappearance, 99 cases of harassments, and the filing of trumped-up charges against 176 leaders and members of IP organizations, with 7 leaders incarcerated. Almost half of the EJK victims in the country are from Mindanao, 56 of which were Lumads. KATRIBU recorded 9 incidents of bombing of communities and farmlands, and 54 cases of forced evacuations in Mindanao displacing more than 40,000 Lumads since President Aquino took office. The CHR would release a statement only on November 2 condemning the violations committed against the Lumad people. The commission would also hit the NPA for the execution of Loreto Mayor Dario Otaza and his son. The commission said that both AFP and the NPA violated rights to life. Lumad leaders have accused Otaza as the local paramilitary group recruiter for the military and drug lord. The Lumads said that they could attest to the violations of the military against our people and our communities and that is why they came to Manila. “It is the government’s job to raise their issues with the NPA, not ours. They are at war with each other. But the paramilitary and the military killed Lumads, they killed civilians, killed one of our own. That is equal to the government killing its people and we should speak out about that,” said Datu Jumorito Guaynon, spokesperson of Manilakbayan 2015. Lumad leaders were dismayed at the ambivalence of the human rights agency, for they felt that when the government invokes the NPA seemed to mean that they would also do nothing with the military. “These government agencies do not respond to the Lumad issues straight up. They would invoke the NPA and when they do that, they meant to lessen the culpability of the military. They meant to confuse the issue. The Lumads, the children, saw the paramilitary blew out the brains of the Lumad datus while the military hangs around nearby. What is not clear about that?” said Arlene Brosas, 2nd nominee of Gabriela Women’s Party. The Lumads also suspected the agency to be doing “only lip service” to the issue and “playing safe,” as no concrete actions to the issue have been demonstrated. Members of UP Diliman community, supporters and Lumad people lit aroung 1,000 candles in front of the Palma Hall to remember the slain Lumads and all those who fell victims to militarization and development aggression. Sacks of vegetables, rice, clothes, blankets, toys and boys were also delivered by organizations, families and individuals who dropped by the kampuhan. More than 700 breakfast packs were served for the Manilakbayan delegates from Bagong Alyansang Makabayan QC and POWER QC. Come nighttime, village councils, local government officials and local organizations also shared solidarity messages and pledged various forms of support to the Manilakbayan in the cultural night hosted by BAYAN Quezon City. 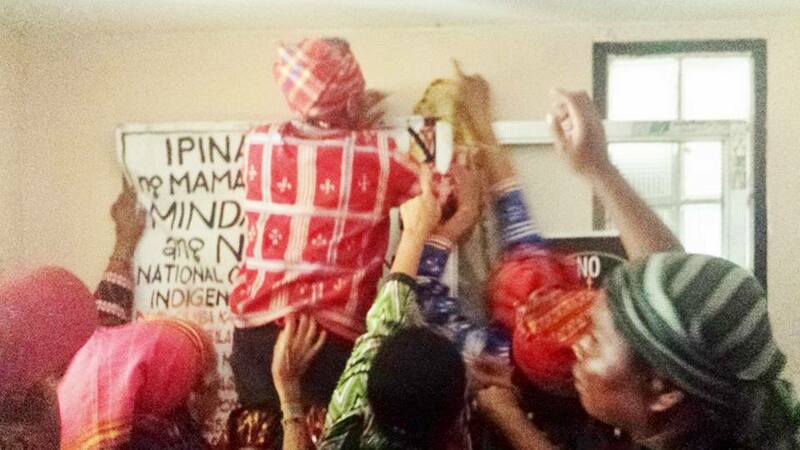 Lumad delegates of the Manilakbayan ng Mindanao 2015 stormed the National Commission on Indigenous People (NCIP) office in Quezon City to call for the abolition of the NCIP. 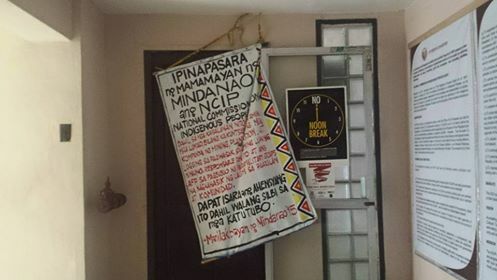 Lumads posted their version of a closure order on the NCIP’s front door for being complicit in the violations of indigenous peoples’ rights in Mindanao. Media reported that NCIP Chairperson Leonor Quitanyo accused the New People’s Army (NPA) as the main perpetrator of the Lumad killings. According to Quitanyo, most of the 500 indigenous peoples killed were killed by the NPA. The Lumad leaders branded the claims of the NCIP chair as “government propaganda to divert the issue” as there is no answer to the demand for justice for the killings perpetrated by state forces against the Lumads. 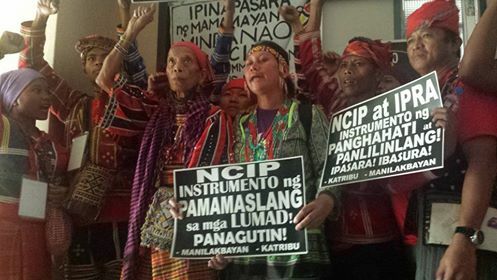 The Lumads also criticize the NCIP chair for giving no response to the demand for military and mining operations pullout that invades the Lumads’ lives and ancestral lands. Lumad leaders also observed that the NCIP chair statement as “towing the government propaganda implicating us Lumads who are the true victims here.” Various government agencies responsible for issues raised by the Lumads and the military have been in chorus attributing the killings to tribal wars and that many Lumads have become NPA rebels. MADAKU HAN SALAMAT. Lumad leaders planted narra trees in UP Diliman to express their gratitude to the whole UP community for hosting their weeklong campout. The tree samplings symbolizes their life and their connection with nature, these were planted along Magsaysay Avenue. The samplings were expected to mature in a few years, which will provide canopy for the avenue. For their last night in campus, Manilakbayanis prepared a cultural program for their hosts and supporters. Chancellor Michael Tan was present, as well as actor Alex Medina, musicians Dino Concepcion of Brownman Revival, Dong Abay, Jess Santiago and Chikoy Pura of the Jerks. Beauty queen Venus Raj visited the kampuhan and took time to talk with the Lumads. Manilakbayanis were quick to pack and clear their temporary camp in UP Diliman to be able to quickly set up camp in their next destination, Liwasang Bonifacio in Manila. Before leaving UP Diliman, Lumad leaders visited UP Diliman Village Chairwoman Isabelita Gravides. The village council hosted lunch for the delegates of #Manilakbayan2015. The weeklong kampuhan of the Lumad in UP Diliman fostered an atmosphere of purpose and protest in the university known to be the bastion of youth activism in the country. Students, teachers and residents modified their routines, found time to go the kampuhan way for a visit and found something to share whatever they can or have to the Lumad. Manilakbayanis paid tribute to all the martyrs of Mindanao and victims of enforced disappearances under President Benigno Aquino III’s term, through his counter-insurgency program Oplan Bayanihan. Manilakbayanis wore black shirts and marched from the University of Sto. Tomas to Liwasang Bonifacio. The Integrated Bar of the Philippines (IBP) called for an end to “a systematic military-sponsored occupation of tribal lands and forced eviction” of the Lumad. The IBP urged that those responsible for the murders of Lumad leaders and the displacement of thousands of indigenous peoples in Mindanao be found and prosecuted to the full extent of the law. Manila City Mayor Joseph Estrada and Vice Mayor Isko Moreno signified their support to the plight of Lumads against attacks on their schools, communities and people. City councilors led by Councilors Leilanie Marie Lacuna and Yul Servo with Vice Mayor Isko Moreno approved and signed City Resolution No. 423 supporting calls to ‪#‎StopLumadKillings and stop attacks against schools, communities and people in Mindanao. The city councils of Marikina and Caloocan have previously approved resolutions calling for an end to paramilitary attacks on Lumads. 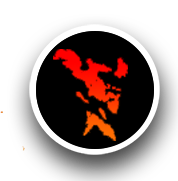 The resolution by Caloocan City was signed last October 27, 2015, urging the national government to stop paramilitary attacks in indigenous communities to protect their culture. The resolution by Marikina was adopted on November 9. These local government, through their resolutions, expressed support in calling for an end to violence in Lumad schools and communities. The resolutions also denounced plunder of the natural resources in Lumad ancestral lands and its damage to the Lumad culture. Through these resolutions added the outpouring support for the #StopLumadKillings campaign and pressure for the national government to act upon the cases of militarization and killings in their communities. Hundreds of Manilakbayanis staged a protest at the head office of the Department of Justice (DOJ) in Manila and slammed the agency’s role in whitewashing the culpability of the Aquino government in various cases of Lumad killings, enforced disappearances and trumped up charges against the people of Mindanao. Lumads recalled how the Secretary of Justice of the Aquino administration, Leila de Lima, once exposed and fought the ‘culture of impunity’ in the country when she served as CHR commissioner to former president Gloria Arroyo. Lumads accused De Lima for ‘doing nothing’ and the Aquino administration for perpetrating injustice, which they also demonstrated by painting an ‘X’ mark over the word “justice” in the DOJ signage. Arroyo’s term was often described ‘undeclared Martial Law’ by human rights advocates. The Lumads, while welcomed and supported by the Manila local government, was given a deadline of occupation by November 12, instead of the requested November 19. From UP Diliman, the Lumads have since been encamped in Liwasang Bonifacio in Manila. To add insult to injury, the obvious reason for another pending displacement is the coming Asia Pacific Economic Cooperation (APEC) Summit. The Economic Leaders’ Meeting, attended by heads of economies (presidents and primer ministers) of the 21 member countries and some observers, would be held in Pasay, a city that bordered Manila to the south. The Lumads recognized that the harassments against them in their ancestral lands were committed in the name of mining and environmental plunder, which the APEC vigorously pushes among its mineral-rich country members like the Philippines. The Manila local government allegedly received strong pressure from the Aquino administration to enforce the November 12 deadline given to the ‪#‎KampuhanSaLiwasan of Lumads. Noticeably around the same time, street vendors, street children and homeless families have begun to be cleared away from the streets. Class and work suspensions in Metro Manila were earlier announced and people have been advised by various government agencies to “stay home’ or “take a long vacation outside Metro Manila,” prompting netizens to react that those moves were meant to ease traffic or project that the national capital had always been travel-friendly. To the Lumads, their protest camp have either been relegated to a nuisance or a matter for cleanup in preparation for APEC or a threat to the image that the national government wanted to project. The Lumads asserted that the Manilakbayan ng Mindanao 2015 is a legitimate protest against APEC and imperialist globalization and plunder because of their oppositions against APEC-prescribed mining activities and plantation expansions in Mindanao that resulted to the numbers of Lumad killings, attacks on their schools and indigenous communities and also worsening effects of natural calamities such as when typhoons Sendong (2011) and Pablo (2012) ravaged Mindanao. Manila Auxiliary Bishop Broderick Pabillo visited the Lumad camp site in Liwasang Bonifacio, Manila and listened to the stories of the Lumad. Thirteen Lumad leaders led by Datu Kerlan Fanagel welcomed Bishop Pabillo. Pabillo told delegates he will endorse #StopLumadKillings activities to his committee members on Social Action, Justice and Peace commission of the Catholic Bishops Conference of the Philippines. The Catholic bishop expressed concern on the intense militarization in Lumad areas and the inaction of Department of Education on the attacks on Lumad schools. The fans of TV show Eat Bulaga loveteam Aldub (a portmanteau of the couple’s names Alden and Yaya Dub) brought breakfast for the Lumads at their kampuhan in Liwasang Bonifacio. Official Aldub lawyer Neri Colmenares and artists Bayang Barrios and Mae Paner joined Aldub fans and brought breakfast for them as well. Maine Mendoza also joined the call by posing while holding a banner with a call ‘#StopLumadKillings’ written on it. This was uploaded in Randy Evangelista’s facebook account last November 7, 2015. Also, her brother-in-law, John Carlos Catalan attended the Aldub Breakfast for Lumad and brought 850pcs coffee and one sack of rice. Catalan was dubbed as ‘Pambansang bae-yaw’ and has been an active supporter in Lumad’s campaign. In his twitter account he thanked the AldubNation for helping them prepare for the breakfast with the Lumad people. A photo of Yaya Dub, Maine Mendoza in real life, holding a fansign with the message “We stand with the Lumads #SAVEOURSCHOOLS” was uploaded in Randy Evangelista’s Facebook account last November 7, 2015. Mendoza’s brother-in-law, John Carlos Catalan, took part in the Aldub Breakfast for Lumad activity and brought coffee packs and a sack of rice. 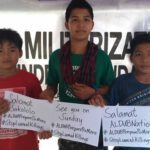 In his Twitter account, he thanked Aldub fans, collectively known as AldubNation, for helping them prepare the breakfast for the Lumads. Inspired by the bayanihan the fans exercised during Eat Bulaga’s major concert-gathering on October 24, titled “Tamang Panahon”, an Aldub for Lumad group and campaign grew within Aldub Nation. Full proceeds of the Tamang Panahon were promised for building libraries for impoverished or dilapidated government-run schools. The alternative Lumad schools were also said to be among the beneficiaries of the project. Invited and present at the “Tamang Panahon” concert were some Lumad children, with whom many fans took selfies and became aware of the Lumads protest caravan in Metro Manila. The Aldub Breakfast for Lumad activity was an expression of support of the Aldub Nation to the calls to ‪#‎StopLumadKillings and stop attacks against schools and indigenous communities in Mindanao. Lumad students protested military encampment of their schools. Around 100 Lumad students who came to Manila with the Manilakbayan ng Mindanao 2015 campaign and children’s rights advocate groups protested in front of the central office of Department of Education (DepEd) in Pasig City. The students challenged DepEd Secretary Bro. Armin Luistro to revoke DepEd Memorandum 221. The groups blamed the said memo for legitimizing the AFP and paramilitary groups to camp in Lumad schools and use the schools for their military operations. Since April 2015, Lumad schools and its volunteer teachers hold classes in evacuation centers because Lumad schools were closed down, destroyed or encamped by soldiers. 1. Since April of 2014 up to present, 25 Lumad schools and community schools were forced to halt operations for the entire month of June due to harassment by the AFP and sanctioned by the Department of Education (DepEd). 2. At least 84 cases of attacks on 57 community schools have displaced and disrupted the education of over 3, 000 Lumad children. 3. Two (2) minors were brutally killed by the elements of 3rd Company of the1st Special Forces Battalion under the ground commander Capt. Balatbat with Col. Nasser Lidasan as Battalion Commander on August 19, 2015 in Pangatukan town, Bukidnon province. They were part of 5 Manobo tribals strafed and killed on suspicion of being NPA combatants. 4. The schooling of Lumad children under the Tribal Filipino Program of Surigao del Sur was disrupted when residents of Brgy. Siagao, San Miguel, Surigao del Sur were displaced. Brothers Ely and Crisanto Tabugol, residents of the said community, were killed by an armed group led by Hasmin and elements of the 36th IBPA. 5. A Lumad child was among 14 farmers in White Culaman, Kitaotao, Bukidnon who were illegally detained and arrested by elements of 8th IB ug 23rd IB headed by Nicolas Rivera and an official named Tocmo. All were accused as members of the New People’s Army in contrast to the fact that they are members of organizations Nagkahiusang Mag-uuma sa Barangay White Culaman ( NAMABAW) and Tinananon Kulamanon Lumadnong Panaghiusa sa Arakan (TIKULPA). The Army threatened to burn down the MISFI-run (Mindanao Interfaith Services Foundation Incorporated) school which offers 7th and 8th grade education in Sitio Dao, Bukidnon. 6. Adding to these abuses is the ongoing mass evacuation of the Talaingod Manobo people in Davao City since April of this year due to intensified military operations and threats from the terrorist paramilitary group ALAMARA. Around 1, 000 individuals from San Fernando Bukidnon, Kapalong and Talaingod, Davao del Norte have sought sanctuary at UCCP Haran, Davao City. Learners from Salugpungan Ta Tanu Igkanugon Community Learning Center Inc (STTILCI) in Talaingod have been holding their classes at the refugee camp since the evacuation started. Worse, three soldiers of the 1003rd Infantry Brigade raped a 14-year old Manobo grade 4 student of the Butay elementary school while conducting military operations in the area. 7. Last month, the Rural Missionaries of the Philippines-Northern Mindanao schools in Agusan del Sur and Bukidnon have earlier reported harassments and threats from suspected state forces in the form of anonymous text messages, private message via facebook, and surveillances. In March 18, 2014, an RMP-NMR school grounds in Binikalan, San Luis, Agusan del Sur was strafed by 26th IB troops disrupting the graduation practice of the school. In Sarangani province, administrators and faculty of the Center for Lumad Advocacy and Services (CLANS) which provides education to indigenous Blaan children have been filed with false criminal charges of serious illegal detention of evacuees and inciting to sedition. Sec. Luistro, a Lasallian brother, did not come out to meet with the Lumad children. The office instead sent out a DepEd representative who told the delegation that cases filed against military encampments was being investigated. “Since 2012, several dialogues were set where Luistro vowed to investigate and act on the cases presented to him by the students and Save Our Schools network. But every year the cases on the attacks on schools increase and abuses intensify,” said Kharlo Manano, lead convenor of Save Our Schools network and Secretary General of Salinlahi Alliance for Children’s Concerns. Musicians Bayang Barrios, Aiza Seguerra and wife Liza Diño visited the Lumad camp at Liwasang Bonifacio. Seguerra and Diño signed the Stop Lumad Killings petition and chatted with the Lumad. The child actor turned musician has been very active in posting her support for the Lumad in her social media accounts. Also, poet, spoken word artist and Internet celebrity Juan Miguel Severo visited the kampuhan and performed for the delegates. The Marikina City Council with Mayor Del De Guzman and Vice Mayor Fabian Cadiz welcomed Lumad leaders and the Manilakbayan ng Mindanao 2015 contingent for a day of integration at Marikina City. Part of the City Council resolution approved on November 9, 2015 was to help the Lumad disseminate their plight and calls in offices and schools in the city. In return, Lumad leaders expressed their gratitude to the city’s warm support and the Marikina City Council Resolution to ‪#‎StopLumadKillings by offering “tubaw,” a native kerchief, to the city officials. Manila Archbishop Luis Antonio Tagle was among the prominent personalities who unassumingly and voluntarily made his way and reached out to the Lumad in their self-made temporary camp. The church leader, recently appointed President of Caritas Internationalis by Pope Francis, called on the Aquino administration to immediately disband and disarm the paramilitary group, which he believed were responsible for the attacks and murders at Lianga that resulted in the evacuation of the Lumad from their ancestral lands. In his visit, he demanded the national government to stop any military operations in Lumad communities and install peace in the area. He called on fellow dioceses to heed the call of the Lumad people and provide assistance to them. Lumad leaders expressed gratitude to Tagle by adorning him with a tubaw, as they have done with those who supported them. The Catholic Bishops’ Conference of the Philippines (CBCP) has issued a similar strongly-worded statement criticizing the way the Aquino government is handling the Lumad killings. Lumads and environmental activists protested in front of the DMCI and Alsons offices in Makati City to slam APEC-prescribed mining plunder in Mindanao. The Alsons and DMCI are known local middlemen companies of the foreign mining corporations, who in turn have known links to paramilitary groups and military ‘investment defense forces’. These corporations are accused of funding the paramilitary groups that wreak terror in the Lumad communities, especially in areas with mining projects. Alsons own the Tampakan Mining project while Nickel Asia, a local partner of the Japanese miner Sumitomo, operates nickel mining. The protesters then stormed the head office of the Mines and Geosciences Bureau (MGB) of the Environment and Natural Resources Department in Quezon City. They called for the junking of the Mining Act of 1995 and APEC-prescribed mining activities in Mindanao. The protesters also demanded that the MGB categorically demand the pull-out of military and paramilitary troops from mine-affected areas in Mindanao. President Fidel V. Ramos signed the Mining Act last March 3, 1995, paving way for the large scale and foreign mining corporations to plunder our natural resources. MGB Director Leo Nazareno replied that the abuses were now being investigated, while Chamber of Mines’ Vice President for Legal and Policy, Ronald Recidoro, belied the existence of large-scale mining corporations in Lumad communities. He also told the Lumads to file a formal complaint against the operations. Lumads slammed the denial of Chamber of Mines, stating that various large-scale mining firms have been operating in the ancestral lands of indigenous peoples in Mindanao, with as little as the ‘Free Prior and Informed Consent’ mechanism to allow the displacement and slow demise of the Lumad’s communities and way of life. The Philippine Normal University (PNU), leading state university for the development of educators, hosted the Mindanao Human Rights Summit where Lumad leaders shared their situation in Mindanao. Attendees of the summit unite to further strengthen the call to #SaveOurSchools and #StopLumadKillings. Some PNU students expressed their interest to become volunteer teachers in alternative Lumad schools. Manilakbayan ng Mindanao 2015 delegates and the Philippine Normal University community lit a bonfire as culmination of the 6th Mindanao Human Rights Summit. “Pangiyak Ki!” is a benefit concert for solidarity and justice in Mindanao was held on what would become their last night at Liwasang Bonifacio. Pangiyak is a Manobo word that means “shout” in English. In efforts to express solidarity with the Lumad in various public gatherings throughout the Manilakbayan, the word pangiyak when uttered by a speaker in a program has become a signal for audiences to respond with cheers or battle cries. Well-known artists who performed were Bayang Barrios, Aiza Seguerra and fliptop favorite BLKD. 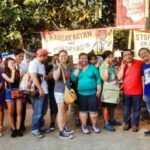 AlDub Nation returned to the Manilakbayan 2015 protest campout to have dinner with the Lumad. They brought bottled water, sacks of vegetables, art supplies and art bags. John Carlos Catalan, brother in-law of Maine Mendoza, led the OhMyGulay call for people to donate vegetables to the Lumads in the kampuhan. Lumads have time and again mentioned how they missed eating the food they plant in their lands, which they had in abundance. Since they have left their lands, they have been eating whatever is available in the evacuation center or (even now) in the Manilakbayan kampuhan, usually processed food. The dialogue between Lumad leaders and Manila City Mayor Joseph Estrada ended with the request to extend the Lumad stay at Liwasang Bonifacio denied. Manilakbayan ng Mindanao delegates marched from Liwasang Bonifacio to Mendiola to slam Aquino administration’s pressure to disperse camp. The Redemptorist missionaries offered sanctuary to the Lumads at their church in Baclaran. The church is also known as the National Shrine of Our Mother of Perpetual Help which devotees from all over the country flock, especially every Wednesday. Hundreds of cops and their buses at the Baclaran Redemptorist Church blocked vehicles of Lumads. Some of the delegates of Manilakbayan were able to sneak past the police blockade. They were accommodated at the Iglesia Filipina Independiente (IFI) or Aglipay church along Taft Avenue. Lumad leaders joined by priests of Redemptorist Church and international support organizations announced their Anti-APEC protest rally in a press conference. Lumad leader, Jumorito Guaynon also slammed the overkill security measures of the Aquino administration to pave way for the APEC summit. 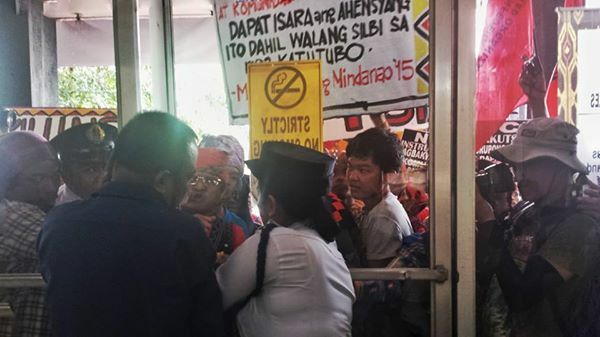 The security measures have made sure to also override the people’s constitutional rights to expression and assembly, protested the Lumad leader. Foreign delegates of the International League of People’s Struggles (ILPS) visited the Lumad camp at Baclaran. Activists from various countries expressed solidarity with the Manilakbayan’s call to stop the militarization in Mindanao and justice for the victims of extrajudicial killings. They also condemned the police blockade that prevented the Manilakbayan delegates from freely leaving and re-entering the compound. “We have to unite and struggle against the inhuman enemies that we are facing. We all are in one trench. If we unite and coordinate our struggle, we will be victorious,” said Leila Khaled, one of the leaders of the Palestinian struggle for national liberation. Earlier this day, Pasay, the Parañaque and Las Piñas Peace Council (three cities that border each other), a body said to have been formed for APEC security, asked why the Lumads were allowed to stay in the church and said they presented a security concern for the APEC Summit. Hundreds of Manilakbayan ng Mindanao delegates marched from Liwasang Bonifacio to Mendiola to slam Aquino administration’s pressure to disperse camp. Tarpaulins the height and length of the wall of the Redemptorist Church compound along Roxas Boulevard were put up. Buses and firetrucks also surrounded the gates of Baclaran Church to prevent the delegates from joining Anti-APEC actions. Lumad children made kites and flew them atop the carillon bell tower of Redemptorist Church in Baclaran. The kites bore “Junk APEC” calls. The kite-flying was the Lumad children’s response to the literal ‘cover up’ done by Philippine authorities of the people’s woes aggravated by agreements made through APEC. Police tents were put up along the tarpaulins installed to block view of the Lumad camp inside the Baclaran church and passage of Lumads through Roxas Boulevard. The Lumads and peasants of Mindanao are directly affected by the directions of multilateral meetings such as APEC, where the role of small, poor countries like the Philippines have always been to provide raw materials and the extraction of its natural resources. Mining explorations and logging and plantation expansions in Mindanao agreed through APEC, an instrument of globalization played by rich countries such as US, Russia, Japan and China, have plundered the natural resources of Mindanao. As economic leaders arrived for the APEC Summit, indigenous peoples and support groups from Northern Luzon and Southern Tagalog in the country reached Manila and echoed their condemnation and opposition to the destructive development and foreign-capitalist mining agenda being peddled and promoted by APEC. The Dumagats of Sierra Madre, the Mangyans of Mindoro and the Igorots of the Cordillera joined the Lumads of Mindanao in Manila to welcome the APEC Summit with protest. The Manilakbayanis were allowed to hang big “Junk APEC” banners in all four corners of the top of the six-storey carillon bell tower inside the Redemptorist Church compound. One side faces Roxas Boulevard and may be seen from as far as a street away from Mall of Asia, since there was no other tall structure in front of it. The Department of Local Government (DILG) NCR and the Pasay, Parañaque and Las Piñas Peace Council immediately proceeded to the church to ask that the banners be removed. The reason they offered for such demand was that the Roxas Boulevard was a designated APEC lane. Earlier the same day, officers from Philippine National Police (PNP) and DILG NCR came to say that the Lumads should not be allowed to leave the church compound through the Roxas Boulevard gate since the “no permit, no rally” was enforced from the airport area, Roxas Boulevard to TM Kalaw. Doubtful, however, if any rally permit applied during that time was to receive any permit. The banners stayed. Foreign delegations that stayed in Solaire, including the party of Mexican President Peña Nieto, saw the said banner and was said to have complained to Malacañang and asked that the banners be removed. From the information of the government emissaries who asked to remove the banners, the delegations of Chile, Russia and Thailand also saw the banner. In the afternoon, a group of anarchists entered the church and tried to give free lugar (rice porridge) to the Lumads. The church remained open to the public, especially devotees of the Our Mother of Perpetual Help. The anarchists forcibly put up their own tarpaulins discrediting the Lumads, which the Lumads and the church administrators asked to be removed. The anarchists resisted and argued that they are anarchists and that no one owns anything so they may put up their tarpaulins wherever they wanted. The Manilakbayanis saw police with firearms waiting on the unfolding scene and suspected that these anarchists may have been sent by the police themselves to cause trouble and to allow the police to claim authority to enforce order, enter the church premises armed, intervene in the squabble and even disrupt the Lumad camp. The conviction of the Manilakbayanis was enough to drive out the anarchists. The PNP also beefed up security around the Redemptorist church, deploying 800 more policemen from Iloilo, Antique, Roxas, Samar and Leyte. This was in addition to around 400 policemen from Pasay, Parañaque, Las Piñas and Cavite and fire trucks from Binangonan, Rizal. Armed policemen were also seen roaming inside the church compound. Father Teody Holgado, head priest of Baclaran Church, demanded the police forces to leave their guns and truncheons outside the church vicinity if they are just going to attend mass. The priest said the police violated the “no firearms rule” inside the church premises. Manilakbayan ng Mindanao 2015 Lumad delegates staged a protest against APEC at the Redemptorist Baclaran Church compound. Cops blocked them from even setting a foot out of the Roxas Boulevard gate of the church. Tension rose when police officers and military trainees physically blocked the gates and pushed back the Manilakbayanis who intended to march to Liwasang Bonifacio and join the people’s anti-APEC mobilization. At least 15 were injured. Some 100 Lumads were able to slip past the blockade and joined the protest in Buendia. The indigenous peoples led the burning of the vulture effigy that the protesters said represented the US and the APEC. The peoples anti-APEC rally was able to breach police blockades and cordons to reach a few blocks away from the Philippine International Convention Center where the APEC Summit was being held. Dominant media live news reporting revealed that the rally’s chanting and program reached the PICC. Despite huge tarpaulins, container vans and police cordon which were set up along Roxas Boulevard to cover the protest camp from the APEC leaders and stop Manilakbayanis from joining the anti-APEC protests, delegates remained defiant. The Manilakbayanis put up a tall “Junk APEC” banner from the ground and inside the church that seemed to have earned more ire from the police. The banner was installed on bamboo poles higher than the church wall and the tarpaulin obstruction of the police along Roxas Boulevard. Policemen hit the banner hard from outside and tried to pull it down without success. As the month-long protest caravan came to a close, hundreds of supporters flocked to Baclaran church to bid farewell to the Lumad. The Manilakbayanis presented a cultural program to thank its supporters. The program consisted of performances from delegates grouped by regions. The performances reflected the situation in their areas and common among them were militarization, mining and human rights violations against the residents, be they Lumad, Moro or peasants. Various volunteer groups of youth and children from the Redemptorists Baclaran church also offered performances for the Manilakbayanis. As APEC leaders started to leave the country this day, the Manilakbayanis received reports of the “Junk APEC” banners being seen from departing aircrafts. Members of Aldub Nation—meaning fans of the Aldub loveteam—held a send-off program for the Lumad. The fans of Aldub gathered biscuit donations for the Lumad children so they may have food to tide them over during their days of travel back to Mindanao. This is the third time Mindanaoans staged the Manilakbayan since 2012. But this might be the first time that the public and the nation expressed outpouring support to the enduring issues of the Lumads. Did it take the gruesome killing of two Lumads and one volunteer educator in a day to gain this support and outcry from the Filipino people? We think not. 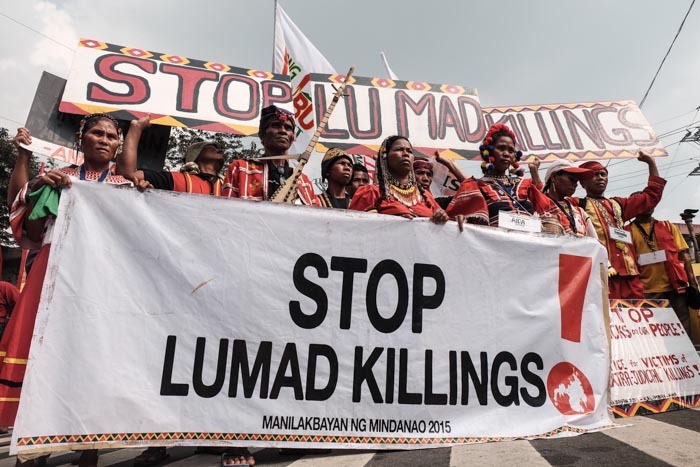 While for the third time, the Aquino administration paid no heed to the Lumads. Uncaring as ever, the Aquino administration issued general statements on the issue while the public clamored for address the killings and militarization and while Metro Manilans showered the Lumad concrete support. In epic proportions of callousness, the Aquino administration had the guts to dish out public relations on the Lumad issue, while wholly ignoring the Lumads who have been encamped and protesting for a month in Metro Manila. And despite the success of the Manilakbayan, impunity still reigns at the countryside. On November 12, an ALCADEV school located in Padiay village, Sibagat town, Agusan del Sur, was attacked. The teachers’ cottage was razed to the ground. In October, a lumad school at White Culaman village, Kitaotao, Bukidnon was shut down by the village chairman Felipe Cabugnason, on suspected instigation by soldiers also of the 23rd Infantry Batallion (IB) and the 8th IB. This resulted to 100 Pulangihan Manobos from Kitaotao, Bukidnon fleeing their communities after military arrived, arresting Lumads, searching houses and forcibly recruiting them to paramilitary groups. There were sentimentalities expressed over the Lumads leaving Metro Manila to journey back home. The Lumads being missed in Metro Manila was abuzz in social media and the last public gatherings held with them. The Lumads have endeared themselves to many supporters, habitual camp visitors and even the public. But Metro Manila is not their home and they were only here to fight to live in their home, in their ancestral lands. But for as long attacks on their communities persist, as long as injustice persists, the nation’s capital could expect more Manilakbayans to come, each journey more thunderous and resounding than the last.